This month, Honolulu City Councilman Tom Berg introduced a resolution that urges the Hawaii State Legislature and the Governor to allow counties to increase the Hawaii general excise tax (GET) by 0.5% to pay for highway and bike lane construction and maintenance. Read the resolution here. “This plan that I’m initiating is not something I even support,” he said. “I’m against the GET increase of all facets. This entire initiative is to let the people to decide” (“Berg proposes tax increase for more roads and bike paths,” KHON2 News,9/27/11). The proposed tax is unaffordable and won’t solve the “problem” of traffic and poor roads. Honolulu rail transit (funded in part by a dedicated 0.5% tax) is supposed to address traffic concerns and reduce wear on the roads. The tax increase would come on top of increases to motor vehicle registration fees, which are supposed to pay for road maintenance. The taxes collected would just be another “special fund” to be raided in emergencies. The tax increase would raise the cost of pretty much everything. The tax increase would hurt lower-income families most. I respect Councilman Berg for representing his community, even when it goes against his own beliefs. But a GET tax increase is not the answer. Please speak out against this proposed tax increase! Councilman Berg’s resolution will be discussed in the City Council’s Transportation Committee on September 29, 2011. The plan centers around a “Complete Streets” policy (SB 718, signed into law on May 6, 2009) that requires consideration of all transportation modes (walking, biking, driving, and riding). Some of the ideas highlighted in the plan include more sidewalks, better connected sidewalks, better sidewalk markings, traffic signal modifications, better lit areas, and improved visibility (by cutting back vegetation and planning for parked cars). There are a lot of education programs for pedestrians and drivers, notably Walk Wise Hawaii (http://www.facebook.com/WalkWiseHawaii), a public education program for pedestrian safety. But we can’t force pedestrians to be more aware on the streets, and we can’t make driving less distracting when drivers must pay attention to other vehicles, traffic signs, parking, pedestrians, bicyclists, and the weather. 1. Create tiered car registration fees. The first car registration per household would be assessed at the standard rate, while additional car registrations per household (at the same street address or apartment) would be higher, perhaps double or even triple the regular rate. Businesses, governments, and taxi/van/bus companies would have different rate structures. This would encourage carpooling and public transportation, potentially cut down on traffic, and make parking a little easier to find, while increasing revenue for road maintenance. 2. Start a car sharing service. Hawaii could create a car sharing service, which would let you sign up for a driving plan (including insurance), reserve a car (in days or even hours), use it, and then return the car. The service should pay for itself, once the initial program and cars are in place. Companies like Zipcar.com and cities like San Francisco (citycarshare.org) and Boulder (carshare.org) are already doing it. And we could use a fleet of electric cars! Better Place, which builds electric vehicle infrastructure, has already opened 10 charging stations in Waikiki and downtown Honolulu, with plans to add 130 charging stations around the state; and Enterprise Rent-a-Car has charging stations available to the public at the Honolulu Airport. 3. Integrate public school buses with public bus service. Instead of a separate bus service, we could add more buses before and after school, with special routes that stop at public schools. We would not have to maintain a separate bus fleet, and there would be fewer students gathering at bus stops and sometimes spilling into the shoulder lanes. It could also save us money: in the 2010-2011 fiscal year, about 37,000 general-education public school students rode the school bus, which cost Hawaii $72 million; meanwhile, student fares brought in only about $3 million, according to the Honolulu . 4. Second-floor pedestrian walkways. In high-density urban areas like Downtown Honolulu, consider second-floor pedestrian walkways between buildings and at intersections.Las Vegas,Nevada, has pedestrian bridges at major intersections along the Las Vegas Strip. There are walkways between large hotels like Treasure Island and the Venetian; and indoor bridges connecting hotels like the Luxor, Mandalay Bay, and the Excalibur. These walkways would reduce pedestrian traffic on the streets, and expand storefront space. However, they would cost a lot of money, require joint effort between different property owners, and drastically change the Honolulu skyline. What are your ideas about pedestrian safety? How can we share our streets safely? If you’re interested, there will be an OahuMPO CAC presentation of the Statewide Pedestrian Master Plan on September 21, 2011; and another presentation at the Hawaii Congress of Planning Officials on September 22, 2011. You can comment on the Statewide Pedestrian Master Plan at http://www.hawaiipedplan.com/Comment.aspx. In August 2011, Honolulu Civil Beat reported that a State Department of Health task force recommends a carbon tax in Hawaii. After the debate on carbon taxes at the federal level, and narrowly avoiding international agreements about carbon emissions and “reparations” to developing nations, I was flabbergasted. Assumption #1: There a problem with carbon emissions in Hawaii. The Task Force reports that “Although Hawaii’s total emissions are a small part of the world’s output, its per capita emissions are similar to other U.S. states.” But it assumes that Hawaii, surrounded by thousands of miles of open ocean and favored with year-round trade winds, has dangerous levels of carbon and nothing else is being done to lower emissions. Assumption #2: Hawaii has the authority to tax carbon emissions. The State and its paid consultants certainly assume that it has the power to tax carbon emissions. The Federal government believes it has the power to tax carbon emissions too. What do you think? Assumption #4: Government has unlimited powers of taxation. According to government, if we do something, or if we don’t so something, government can tax it. And taxes never go away. Ever. Taxes may increase or decrease, but once there’s a precedent, it becomes government’s “right” to tax or not to tax. But think about the precedent: if government can tax carbon emissions because it “owns” clean air, will there come a time when government can tax the air we breathe? Can Hawaii impose a carbon tax? Should it impose a carbon tax? 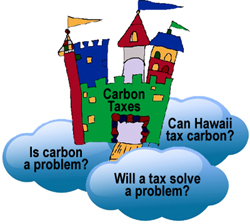 Or is Hawaii building a carbon tax in the air, one without a foundation? What do you think? “We today pledge to withhold any further campaign contributions to the President and all members of Congress until a fair, bipartisan deal is reached that sets our nation on stronger long-term fiscal footing,” Starbucks CEO Howard Schultz proclaimed in an open Letter to America on August 15, 2011. Schultz’s goal is “to set in motion an upward spiral of confidence.” It isn’t about going shopping or spending money – it’s about refusing to donate money to our elected representatives until they do their jobs, and refusing to wait for a government solution. The best part of the Upward Spiral movement is that we can start at home. We can withhold political campaign contributions and decline to attend political fundraisers until Hawaii’s fiscal plan meets our core needs – without raising taxes. Our closed pocketbooks can speak as loudly as opinion polls. To read the full letter and make your own pledge, visit www.UpwardSpiral2011.com or www.facebook.com/UpwardSpiral2011. This revelation is practically buried on page 206 in “A Simple Government: 12 Things We Really Need from Washington (and a Trillion That We Don’t! )” (2011) by former Arkansas governor and talk show host Mike Huckabee. But it’s something that I think strongly reflects the title of this book. Instead of a “simple” government, Huckabee offers us a “slightly more simple” government, based the founding principles in the Declaration of Independence and the Constitution. He never questions whether our nation’s problems can or should be solved by the government. And at times, he is sarcastic and pointed, indulging in criticisms of President Barack Obama’s “insistent partisanship” and reliance on “policy wonks and Ivy League professors” (page 3). 1. A return to family values. We need to encourage families and personal responsibility. 4. A simple and fair taxation system. We should lower corporate taxes, repeal the federal income tax and replace it with a national sales tax, and end the estate tax. 5. A responsible approach to health and health care. Americans like to win! Focus on winning health, not losing weight, reducing fat, or lowering our blood pressure. 6. An education system that values all students. He advocates school choice, no tenure for teachers, merit pay, and personalized learning. 7. Take responsibility for the environment. “Conservation is patriotism,” he says glibly. 10. An effective military policy and strategy. We need to give back to our veterans and keep the National Guard home. “A Simple Government” is optimistic, engaging, and reasonable. 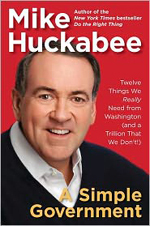 It reads like a conversational campaign brochure, but it also reveals what is important to Huckabee, in his search for common ground with Americans. Find out more at http://www.mikehuckabee.com/a-simple-government. You are currently browsing the Better Hawaii weblog archives for September 2011.